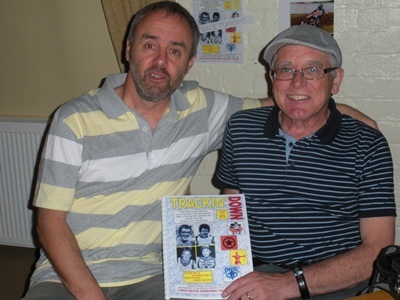 Over the winter months, Long Eaton Speedway fan Ian Gill has been busy interviewing a further four ex-Station Road favourites for his "Trackin� Down" series of books and on June 4th at the 3rd annual Long Eaton Speedway Reunion, he launched Issue 2. The riders featured in Issue 2 are Roger Mills (who rode for Long Eaton in 1967 and from 1971-73), Alan Molyneux (1973-4, 1982-83 and 1985), Gary O�Hare (1988-1992) and Chris Pidcock (1984-85). The 105 page A4 book features in-depth stories from the riders� careers in their own words with many stories receiving an airing for the first time. "Once again," says Ian "I am indebted to the wonderful support and enthusiasm I have received from the four riders concerned, all of whom gave up around three hours of their time to answer the many questions which formed the basis of their stories." 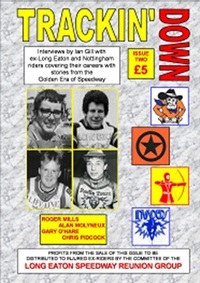 Sales of Issue 1 saw a total of �225 handed over to the Long Eaton Speedway Reunion Group to be distributed to injured ex-riders and Ian is hopeful of a similar success with this new issue. All orders will be sent out by 1st class post as soon as possible.